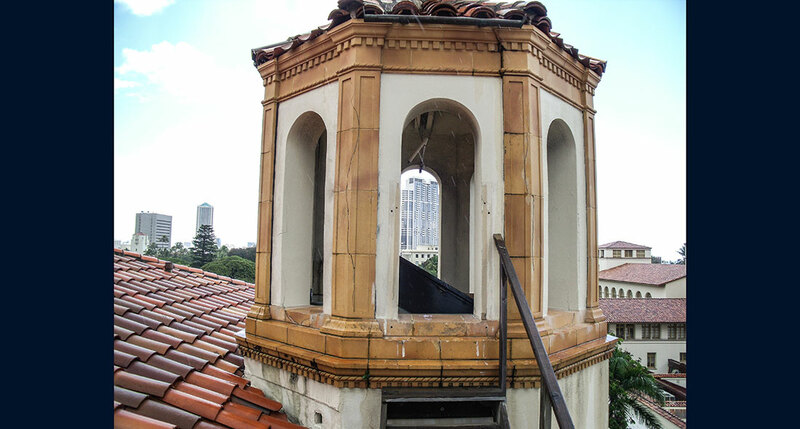 Western Specialty Contractors worked on a project with Richard Matsunaga & Associates to restore the bell tower/cupola on the historic HECO King Street office building. 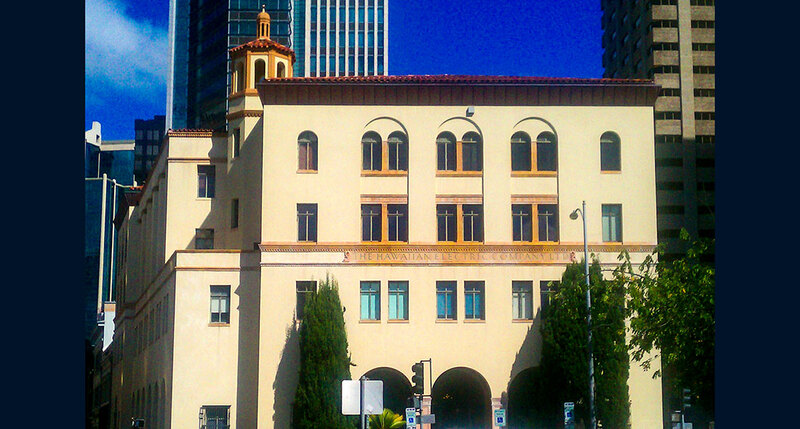 The beautiful Spanish style building was completed in 1927. The building is reinforced concrete with steel framing. The exterior is adorned with terra cotta trim pieces and a stucco finish. After years of exposure to the elements, several pieces of the terra cotta were badly cracked and the remaining pieces were in need of restoration. Western’s Hawaii and Seattle branches put together a joint venture to perform the work. To access the work area scaffolding was erected, installed flush to the building. Safety was of prime importance, since the building was occupied. Overhead pedestrian protection was provided. 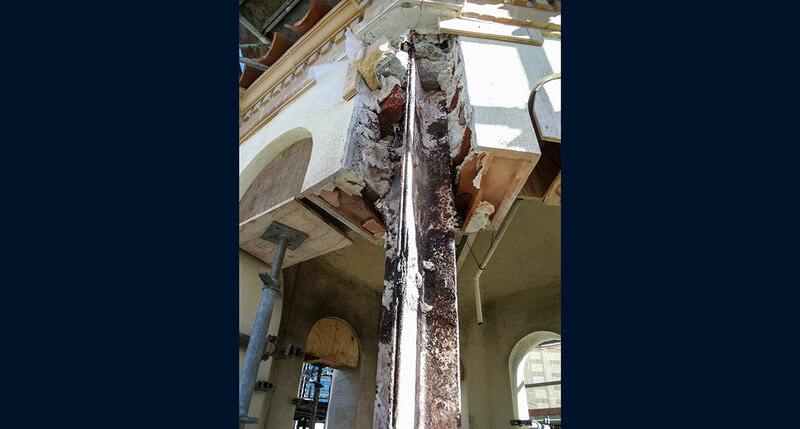 The Western crew worked with the engineer and determined that cracking of the terra cotta was caused by expansion of the rusting steel frame in the columns of the bell tower. The eight columns were demolished down to the steel frame and properly repaired. Because terra cotta is a man made material, molds have to be created so that new pieces can be fabricated. Matching stones from adjacent areas were removed and sent to the manufacturer so that new stones could be produced. This process can take up to 16 weeks for the replacement pieces to be delivered, so temporary plywood was installed over the exposed areas were the terra cotta had been removed. Once the new pieces were delivered they were properly anchored to the building. The remaining terra cotta pieces were patched and profiled with Edison repair materials. They were then cleaned and glazed to match the new pieces of terra cotta with a custom finish product from Edison Coatings. New pointing mortar was then installed to the entire cupola. 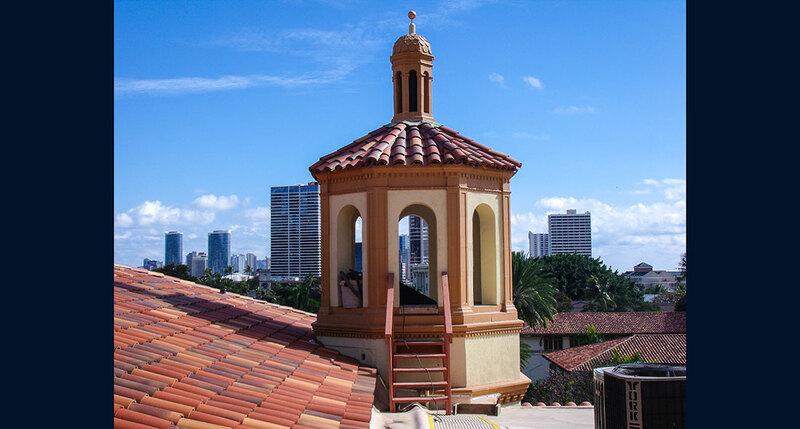 To complete the project, stucco on the cupola was repaired and the bell tower repainted. Western was proud to play a role on the renovation of this historic building.